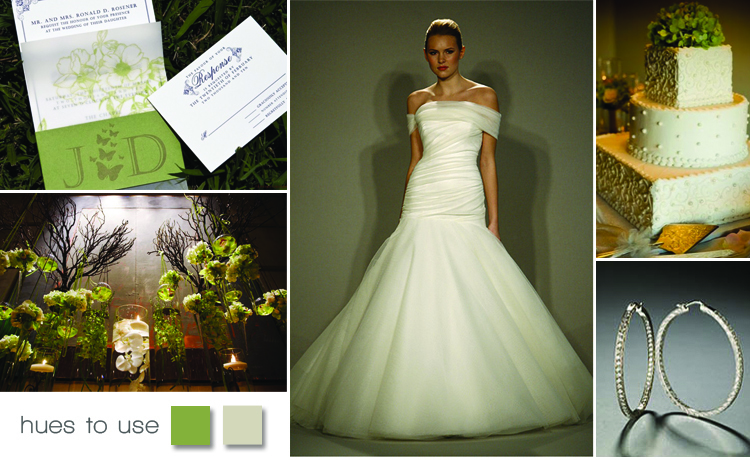 Keep things simple on your wedding day with a moss green and ivory color palette! Make the perfect first impression as a couple with sophisticated, yet charming invitations! We love this invite design by Imaj Design Group! The transparent floral layer gives a pretty, whimsical touch! Turn any room into an elegant paradise with table arrangements from Lush Couture Floral. Try simple diamond hoop earrings from Stanley Korshak in Dallas for a posh, understated look. This Romona Keveza gown, also from The Bridal Salon at Stanley Korshak, is a classic beauty. The flattering ruched bodice and off the shoulder detail would look gorgeous on any bride! Check out this beautiful, three-tier confection from local cake company, Creme De La Creme in Ft. Worth! The green hydrangea cake topper matches perfectly! Enjoy!